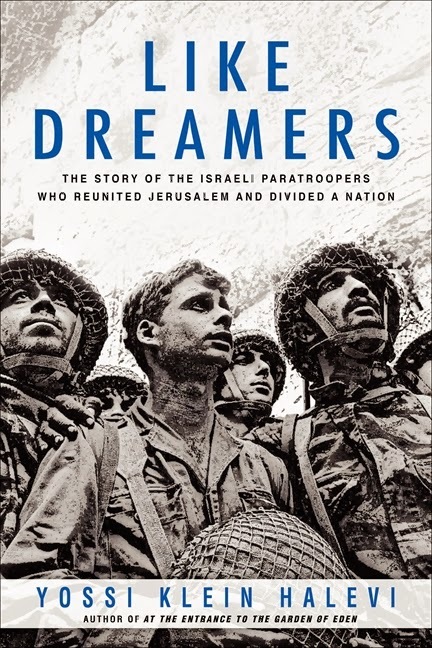 Like Dreamers: The Story of the Israeli Paratroopers Who Reunited Jerusalem and Divided a Nation by Yossi Klein Halevi is the 2013 National Jewish Book Award winner of the Everett Family Foundation Award for Jewish Book of the Year. Mr. Halevi is also the winner of the 2014 Sophie Brody Medal, awarded by the American Library Association to the "author of the most distinguised contribution to Jewish literature for adults published in the United States in the preceding year." Although the book cover is graced by David Rubinger's iconic photograph of Zion Karasanti, Yitzhak Yifat and Haim Oshri by the Western Wall shortly after its capture on June 7th, 1967, the book is not about these three soldiers. It centers on seven of the soldiers that fought and reclaimed Jerusalem: Arik Achmon, Udi Aviv, Meir Ariel, Avital Geva, Yoel Bin-Nun, Yisrael Harel, and Hanan Porat. Moreover, it looks at the Kibbutz Movement and the Religious Zionist Movement and how ideologies and "dreams of Zion" influenced these men not only in battle, but in their lives after the war. For someone who favors literary fiction, this history of modern Israel, told through the lives of its history makers, was fascinating and informative. Avital Geva articulates one of the Zionist dreams. "Could there be greater joy than working the fields with one's closest friends and sharing food grown by their kibbutz?" Others espoused the philosophy of Rabbi Kook, that "the spiritual failure of the religious provoked the rebellion of the secular who, however inadvertently, were preparing the way for the next, higher stage of religious evolution by restoring the holy people to the holy land." There is a riveting account of the battle for the Old City, which tempers the ebullient cry of "Har Habait B'Yadenu" (The Temple Mount is in our hands) with the number of those who died or were wounded in securing the victory. Halevi follows the seven soldiers' lives after the war, their personal endeavors, changing ideologies and politics, as well as their relationships with one another. It was also interesting to read Halevi's assessment of Ariel Sharon in light of Sharon's recent death: "Ever since he was a boy, Sharon had been an outsider. In this farming village, Kfar Malal, his parents were so estranged from their neighbors that he had grown up without knowing what the inside of this friends' homes looked like. In the army he'd been repeatedly denied promotions for which he was most qualified. He's reckless and untrustworthy, opponents said his military exploits leave behind too many bodies. Supporters, though, regarded him as a savior, the IDF's most brilliant commander, inspiring his men to victory. And when the country was in desperate need, whether to stop terrorist incursions in the 1950's or defeat the Egyptians in 1973, it invariably turned to Sharon. And then, invariably, rejected him." There were also some eerie predictions: And he [Sharon] warned that handing control of most of Gaza to Arafat would lead to Katyushas on neighboring Israeli towns like Ashkelon and Ashdod. Arik Achmon laughed when he hear that one, Katyushas on Ashkelon!" Although it wasn't so funny when they closed schools in Ashdod and Ashkeon on January 17, 2014 because of the escalation of rocket fire on both cities. The book ends in 2004, with Yoel Bin-Nun commemorating Jerusalem Day, the holiday celebrating the reunification of the city in 1967, as he did every year: by taking his students on an all-night walking tour of the battleground, from Ammunition Hill, passed the pre-1967 borders, around the wall of the Old City and up to the Western Wall. It is at this point that the verse from Psalms again echoes: "Everything had seemed so clear then, in the summer of '67, when Israel had abruptly emerged from the nightmare of annihilation into the dream of redemption." At that moment, who could foresee the complications and challenges Israel deals with now? In an interview with Seth J. Frantzman in The Jerusalem Post (September 27, 2013), Halevi said that "when you go back and you experience the origins of these movements, there is something thrilling about discovering the details, and suddenly you feel the Israeli story in a different way." Thank you for sharing your discoveries with the reading public. I attended the "Israeli Book Launch" on Sunday, January 19th. It was a great event for a number of reasons. First, because Yossi Klein Halevi discussed the book with Saul Singer (co-author of Start-Up Nation). The author gave some insights into his 11-year journey writing the book and the importance of the "soundtrack" accompanying the history of the modern State of Israel. Second, the event was presented by the Highlight Foundation, whose mission is to create awareness, encourage financial support, and volunteering to worthy causes in Israel -- while sharing an unforgettable, social and fun experience. Extra points for Ruth for remembering my name and checking on the kashrut of the soup that was served. Third, the evening benefited Jerusalem Village, an organization with the goals of providing newcomers with an outlet where they can make an impact on their community and grow their social network; expanding the opportunities for newcomers to have high quality, authentic, social experiences; and encouraging young Jewish adults from all over the world to choose Jerusalem as a destination by creating a welcoming culture. Finally, and heartfelt to me, the event took place at the First Station, the hip new meeting place in Jerusalem in the refurbished Ottoman building and grounds (see E-reading and Jerusalem for more about the old train station). It was amazing to be sitting and hearing about the Six Day War less just a three-minute walk from where the fighting took place. It was definitely worth braving the chilly Jerusalem air for this memorable evening. (The Train Station and the Khan Theater are located in the bottom right on the map).